Offerings enable you to let your prospective clients sign up for and/or purchase your coaching services from your own website. 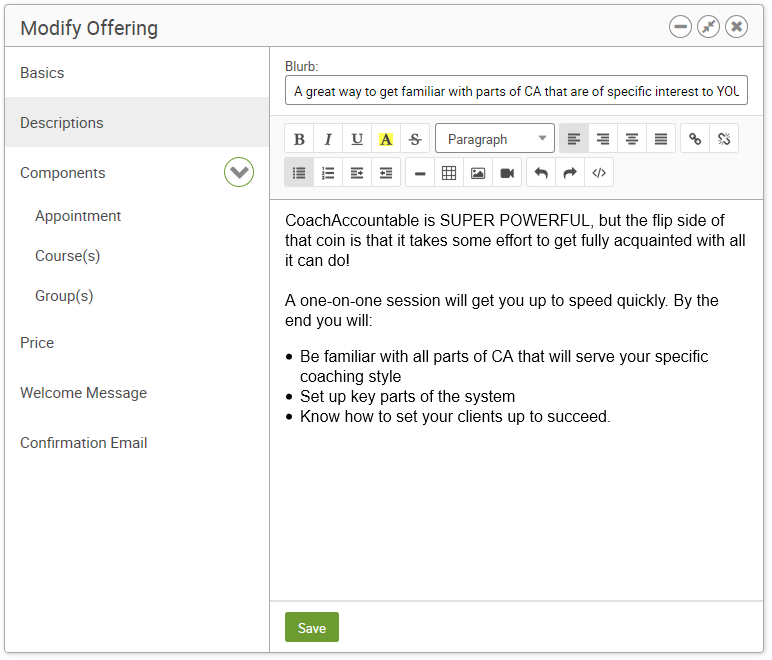 Just paste a little snippet of HTML in your website and CoachAccountable takes care of the rest: a spiffy little widget appears, allowing visitors to your site to book themselves right there. Offerings are a great way to let folks book a complimentary session with you, join a coaching group, or purchase a course that you’ve created. With such versatility in what an Offering can entail, we haven’t been surprised to see so many coaches who have more than one. Enter Offering Bundles. Embedding (or linking to) an Offering makes available one single Offering. 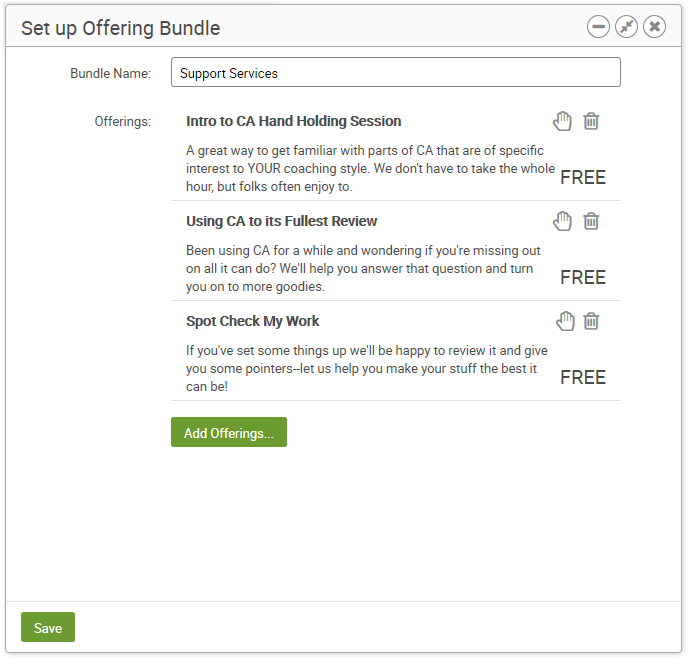 Offering Bundles allow you to take a collection of Offerings and make them available in a single widget (or on a single, standalone page). Setting up a bundle is a snap. Just give it a name, pick which of your Offerings should be included (I suspect *all of ’em* will be a common setup :) ), sort them however you like, and that’s it. Add, remove, drag to sort. ‘Nuff said. Once your bundle is created, you’ll find the same ways of embedding that Offerings have: a <script> or <iframe> tag for a widget, as well as a URL for linking to a fully hosted page. Like with Offerings, Offering Bundles are branded as your own in both widget and full-screen mode. You can also see how this Offering Bundle looks on its standalone page. Feel free to play around with it, and, if you’re sincerely interested in one of these services, we of course welcome you to sign yourself up! A blurb to go on the menu, and a description for folks who want to know more. Whatever blurbs you set for your Offerings appear in the “Choose” step for the Offerings in a Bundle. If you set a longer description (using the WYSIWYG editor just below), that will be accessible as well from that menu. And that’s it! Your online coaching portal is now able to serve as a tidy e-commerce front, making your coaching offerings more readily available to your would-be clients. Enjoy!